Pumpkin spice beers, the hoppiest IPAs and other creative concoctions are outdoing one another as the latest fad in the still-growing craft beer industry – but one local brewer isn’t buying it. 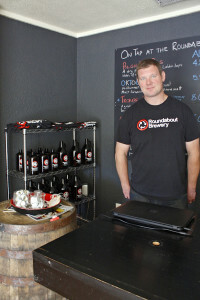 “I just want to use quality ingredients to bring fresh, local beer to my neighborhood,” said Steve Sloan of Roundabout Brewery. After working for 17 breweries around the world and winning numerous awards for his creations, Sloan created Roundabout Brewery in Lawrenceville, calling it a modest brewery with a New Zealand theme. Despite his travels, Sloan said he doesn’t have hopes for world fame; his ambitions are based on his craft and his community. Check out this latest Point Park News Service story by Lauren Dantella. This entry was posted in Point Park News Service and tagged Beer, Brewery, featured, Food and Related Products, Harpoon Brewery, Massachusetts, Microbrewery, Samuel Adams, Steve Sloan by Andrew Conte. Bookmark the permalink.